Hello wine lovers and happy #wineWednesday. I hope you week has been productive and enjoyable. I was up in Penticton for BC VQA panel earlier this week and was able to meet up with Judy Kingston, owner of Serendipity Winery in Naramata for an interview during her craziest time of the year. Judy is nothing short of a modern-day renaissance woman whom I have tremendous respect for. I will post the interview and article here when it is published. On to this weeks’ wine selection which was inspired by Donita Dyer‘s ‘Cinq a Sept’ wine group she created. I attended last weeks’ gathering at Caffé Roma on Commercial Drive. I didn’t fancy the ‘happy hour’ wines so I asked for their wine list. Bolla’s ‘Soave’ was on the list and it was my choice for my glass of wine. Others in the group followed suit and soon the bar was out of stock! It was perfectly timed as it was time for me to head home. Soave is a small wine region in Italy located in the Veneto region close to Verona. Soave DOC wine is made from Garganiga grapes but is able to include small percentages of Verdicchio (Trebbiano) and Chardonnay. Bolla is a large Italian producer and their product quality has always impressed me. This Soave Classico 2012 does not disappoint. With aromas of red apple, pear, some white floral notes, a hint of citrus and almond skin it shouts out to be paired with a great fish dish or salad that is complimented with lemon and lime juice. 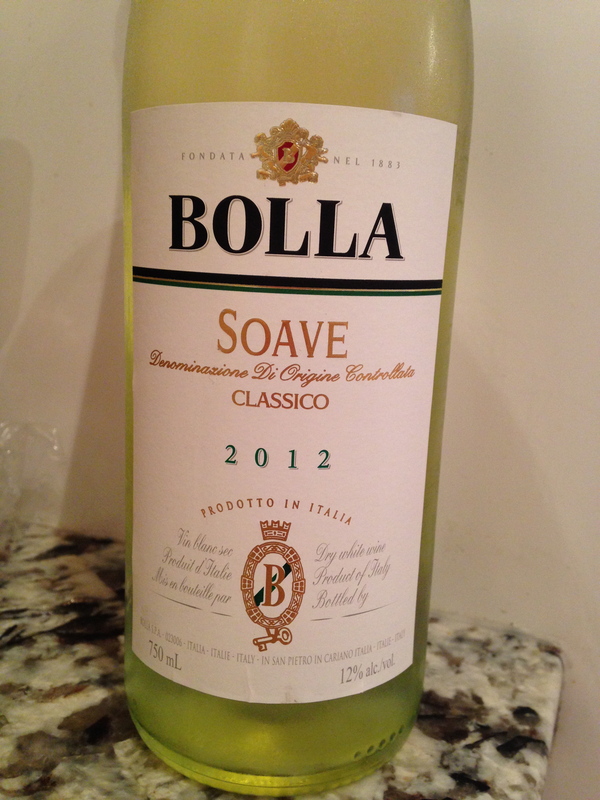 On the palate, Bolla’s Soave Classico is dry and intriguing. It is not a simple wine and has layers to it that are appealing for a white wine. The aroma notes are present on the palate with more of the almond flavour shining through and a dusting of steely minerality. There is a nice medium length finish that calls out for another sip. And, the best part? Yes, it retails for $13.99! You cannot beat this price. I like it for an alternative to Pinot Grigio and Sauvignon Blanc fans will love it to. For all of you Canadians not having a turkey dinner for Thanksgiving – this would be a great choice to please the crowds. That is it for me this week. I am happy to say that my lovely sister, Jessica Campbell and her fantastic partner, Stephen Diebolt, are hosting Thanksgiving this year. I will bring the wine! I find it so confusing that Trebbiano and Verdicchio share a lot of synonyms. Although DNA testing confirms they share a close genetic link, it makes it even more strange when there is the regional name of Verdicchio in Veneto called “Trebbiano di Soave”. Crazy!